The following article is an interview with an environmentalist, vegetarian anarchist from Turkey who is a member of Sosyal Isyan (Social Insurrection) fighting as part of Birleşik Özgürlük Güçleri (United Freedom Forces) alongside the YPG / YPJ in Kobane, Rojava. The interview was conducted by H. Burak Öz and originally appeared on the jiyan.org website. We would like to thank the comrade Ece for translating the interview into English for us. 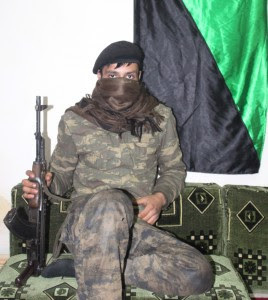 Environmentalist, vegetarian, anarchist combatants who fight in Kobane. We are sitting at the headquarters of United Freedom Forces (Birleşik Özgürlük Güçleri) in Kobane. I ask for a cigarette from a fighter aiming to meet and talk with him. While he offers one, I’m asking how many group form the United Freedom Forces. He says that, this force consist of salvationists (Kurtuluşçular), MLSPB, TDP and anarchists and indicates that he is an anarchist too. What is the aim of fighting here for the anarchists? I’m one of the founders of Social Insurrection and also their spokesperson. When the attack of ISIS started in Kobane, in the name of international solidarity, not considering it too much, we idealized to raise the defense as International Brigades much like in the Spanish Civil War. United Freedom Forces was formed by different socialist factions from Turkey. Being an anarchist, how did you become involved with this structure? United Freedom Forces was founded when we arrived. We made a call to anarchists and ecologists. Are there any other anarchist fighters who came from other countries than Turkey? Comrades came from Italy and Spain. There is also an Argentinian anarchist who fights not with us but in YPG. We defended armed struggle from the beginning of our foundation. Specifically, we were influenced by the view of insurrectionist anarchism of Alfredo M. Bonanno. We founded our own insurrectionist theory. We believe that the revolution will start with armed struggle. First, 3-5 armed acts in Turkish slums like Okmeydanı and now, this all led us to Kobane. But first of all, we dreamed about it.. If we hadn’t dreamed about it and tried to practice it, we would just be drinking beers in a bar in Kadıköy or Beyoğlu. Some of our comrades stayed as they were. How is the approach of Kurdish Movement to you in Kobane? In some way, our presence in Kobane shows that anarchist armed struggle didn’t end in the Spanish Civil War. At the beginning, socialist and Apoist (defenders of Abdullah Öcalan) friends were surprised to see anarchists using guns in here. A kind of an idea of anarchism created in minds. Actually, people don’t really know anarchism in here. They know anarchists as against everything and to all sorts of organization. There is a nice statement by Kropotkin: “Anarchy is order.” We’re explaining and taking the responsibility of it. Even though its responsibility is hard to take, we’re trying to manage it. In which point does theory of the ecological anarchism and the practice in Kobane overlap? We lived such things in here that we couldn’t figure according to which movement we have to act, we couldn’t find the answer in books. This is a military war. For example, we reject all sort of hierarchy but in here, you have to have a team commandant. You can’t give a walky-talkie to everyone in here or no one can act in his/her own way. Maybe the naturality creates its own priorities. We understood what the guidance of Malatesta and natural leadership of Bakunin was here, which we hadn’t understood while reading. There was information, we practiced it and we obtained information once again. What were you dreaming about before coming to Kobane and what did you find? I thought I would have some problems about the chain of command but I didn’t. I didn’t confront with any sort of pressure or difficulty within YPG and United Freedom Forces. Some of our comrades may have screamed while a bullet passed near our heads in stressful times of war but it’s normal. Didn’t any ecological problems occur? You told us earlier that comrades from United Freedom Forces asked socialist friends not to eat meat and to apologize to the animals that they’ve killed but when you were cut off from supplies, you ate mostly meat. Can you talk about that? So many things happened in the mountains. Supplies didn’t arrive. We were hungry and there wasn’t anything else other than the ducks that were left behind by the villagers. When the comrades began cutting the ducks, I said “what are you doing? It’s murder!” but I said it detached from reality, as a reflex. Things that we do according just to theory had collapsed. You are fighting with socialists in the same group. Have any theoretical discussions occurred among you? Even when they do, they are more like banter. We never had a problem. Us and them, we are all conscious that we came here for international solidarity. We are all acting accordingly to revolutionary ethics. We sleep side by side and we eat together. We are trying to understand each other. Maybe we need a new revolutionary theory in the 21st century that this practice may add something into, in terms of understanding each other. You must have had some times that you approached to death. What do you think of in such moments? I definitely had but in battlefront, you think of your comrades. Maybe there are some moments of fear and panic but when you hear gun sounds, they all disappear. I mean, you develop a reflex to protect yourself and your comrades. What is this Coca-Cola can? Don’t touch! It’s a handmade bomb. This entry was posted on Monday, July 6th, 2015 at 11:17 pm	and is filed under Interviews.